I have an xp, that won't boot into windows xp. All i get is a blinking cursor on a black screen. All indicator lights are green on back, thats good. (I was kind of heistant to run it, fake chkdsk virus?) so i did it took about a half hour to complete and said something about changing orpaned files and a bunch of other files. Ever since I ran this i cant get into xp. f2 and f12 are the only options i can get into. I cannot get into safe mode or the screen that says reset to the best known config, which I would love to right about now. I have tried windows repair cd done everything on that and it just shows the blinking cursor again. I have tried re-seating my memory and video all nothing. So if anyone knows how to fix the blinking cursor problem any other way please help. "All indicator lights are green on back" <-- What indicator lights? On the back of what? "f2 and f12 are the only options i can get into" <-- What options does this get you into? Sometimes chkdsk will run on startup if it detects there might be a problem with the harddrive. If you haven't run chkdsk before, or not for a while, this is not uncommon. How old is the computer? Can you give us some more information (make/model or hardware info)? Have you made any software or hardware changes to it lately? When you have the blinking cursor, can you type anything or is it frozen? The more we know about this stuff, hopefully the better we can tailor an answer for you! hello. yes. I have a dell 2350 series. Pentium 4 2 ghz about 768 mb of ram. I want to say it's 3yrs old. The indicator lights on the back of cpu are green that means no failures. I ment these are the only 2 options i have after the dell logo, and then the blinking cursor on top left. I can't type anything in it or do anything it just blinks and xp doesn't load. 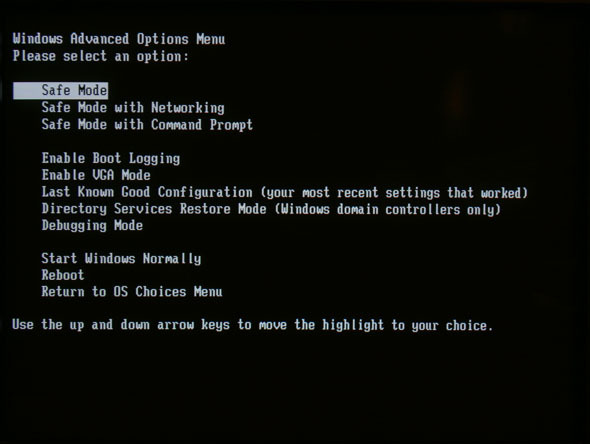 before all this happenes you can hit f4 or f6 to try to start in safe mode that doesnt work, or you could get into best know configuration i cant get into either. Edited by quin8484, 27 May 2007 - 02:06 PM. Before we go any further, disconnect any extra parts that you don't need for XP to start. Like, if you have a USB printer or external hard drive, just unplug them from your computer. Okay, first, I think the BIOS could help us a little. Let's use it to verify that all your hardware is being properly detected. When you start your computer, press the button (you said F2) that gets you into BIOS. Double check that it detects your processor and it's speed, the RAM amount, any optical drives you have (cd-rom, dvd-burner etc), and your hard disks (and their capacities). 2) An error has occurred rendering your XP installation obsolete (hard drive failure, corrupt data, etc...). Next, can you describe for me better what the options are under the F12 menu? Give me some examples. You said you have a Windows repair cd, is this a proper XP installation cd or a Dell recovery cd? At my Bios screen yes, all are listed correctly. My processor speed, ram amount and all others look correct. and some others in that menu. and yes I do have the boot cd that came with my computer. Edited by quin8484, 28 May 2007 - 03:07 PM. When you tried the repair using the XP disk, how far does it get into the process before it goes to the dark screen? duckleader: There are programs that may still be able to recover your data...so long as the drive will still spin up. GetDataBack is one example...I use it and it works. It's free to download and run on the drive, but you must purchase a key to actually recover the data...about $80. For future reference, please start your own topic when you need assistance...to avoid confusion to the original starter of this topic. When I try a repair install from the cd, after the process is done, I take the cd out (so it won't boot from the cd on next boot up) after it says computer restarting in a couple of seconds. The screen boots right to the blue dell logo the right to the black screen with cursor blinking in left hand corner. any commands I can type at the repair console that might fix it? I've tried fixmbr and fixboot all nothing. Edited by quin8484, 29 May 2007 - 04:27 PM. Have a look in BIOS setup...specifically the boot priority. Is it set so the first boot device is the cd-rom and the second boot device is the HDD? Try running the repair again. This time don't remove the cd at the first reboot...don't do anything and it should go on about it's business. See if the repair will complete this way. when i press any key to boot from cd, nothing happens. took a pic of it. Edited by quin8484, 29 May 2007 - 05:21 PM. It IS finding an operating system to repair, though...this is a good thing. Boot to the cd again, only this time load Recovery Console by pressing R on the Welcome to Setup screen. Choose the operating system you want to repair, usually 1. C:\WINDOWS, by number. When prompted for the Administrator password, just press Enter...unless you have set a password. If, at this point or when this check completes, you find yourself back at the command prompt, type exit and press Enter to exit Recovery Console. This is a very long 5 stage check...let it finish. It may appear to hang or even back up at times...this is normal, be patient. you may want to try this to recover your data..